This article presents a comprehensive materials characterization of a pair of Ruby Slippers used in the 1939 classic film The Wizard of Oz, which has been one of the most popular objects on exhibition at Smithsonian’s National Museum of American History (NMAH) since it entered the collection in 1979. The shoes have been on almost constant display with few instances for study during its time at NMAH, and they remain one of the most visited objects within the museum. Plans for an upcoming permanent exhibit, and visible deterioration of the decades-old shoes, led to the present study, which was the first phase of a major effort to preserve this iconic item of cultural heritage for future generations to enjoy. 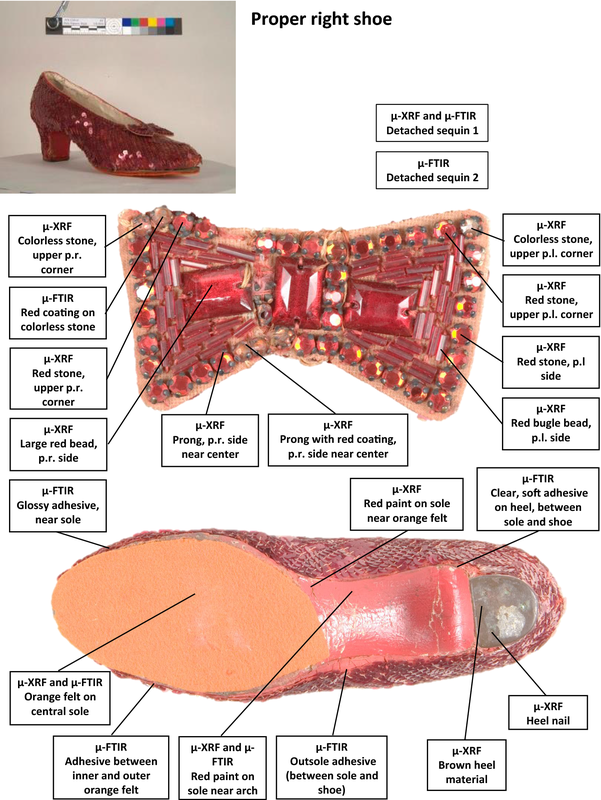 Materials characterization was used to determine the composition of construction materials and condition of the Ruby Slippers to help plan for the optimal environmental conditions for continued display. The current study is also viewed as a valuable opportunity to learn about the original construction and subsequent history of the Ruby Slippers to inform and enrich NMAH’s curatorial research, public programs, and media initiatives. Analytical methods used to characterize the shoes’ components include micro-X-ray fluorescence spectroscopy (µ-XRF), micro-Fourier transform infrared spectroscopy (µ-FTIR), polarized light microscopy (PLM), and high-performance liquid chromatography–diode array detector–mass spectrometry (HPLC–DAD–MS). The classic 1939 film The Wizard of Oz is a fantasy tale about Dorothy Gale (a Kansas farm girl played by Judy Garland), and her journey through the magical Land of Oz. The film is based on the 1900 novel The Wonderful Wizard of Oz by L. Frank Baum (1856–1919). The Smithsonian’s Ruby Slippers (Accession No. 1979.1230) were donated anonymously to the National Museum of American History (NMAH) in 1979 and have been on display almost continuously since that time. The Ruby Slippers are treasured by museum visitors from across the United States and around the world, and will be featured in a new exhibit, Ruby Slippers and American Culture Displays, in October 2018. The Ruby Slippers were designed by Gilbert Adrian, the chief costume designer for Metro-Goldwyn-Mayer Studios (MGM) from 1928 to 1941 . The film’s costume designers altered commercial pump-style shoes by dyeing them red, attaching red netting covered with red sequins to the exterior fabric and heels, and attaching beaded bows on the center of the toes. Several sets of Slippers were made for the film, a common practice with important costumes and props. These items can get damaged during filming or may be adapted for certain uses and scenes during production. The Ruby Slippers were likely worn by Garland in the dance scenes, because the felt glued on the soles is said to have muffled the sound of her dancing footsteps on the wooden yellow brick road. The Ruby Slippers were warehoused among other The Wizard of Oz costumes and props in Los Angeles by MGM until they were rediscovered in 1970 . No information is available on the environmental conditions under which the shoes were stored before they came to NMAH, but it is unlikely that they were consistently stored in a climate-controlled environment. While on display at the museum, however, the shoes have always been under controlled museum-level conditions of relative humidity, temperature, and light conditions. Between 40 years of unknown history and being on display for almost another forty, significant deterioration is clearly visible. Obvious examples include discolored and dull sequins, cracks in the sequins’ red coating, and fading of the dyed netting. The shoes’ composite materials may react differently depending on environmental conditions and their degree of deterioration. An understanding of the materials present, the construction of the shoes, and their current condition was needed to support a long-term conservation strategy. In 2016 NMAH staff requested Smithsonian scientists to conduct a materials characterization survey to serve as a foundation for their planned Kickstarter campaign (see: https://www.kickstarter.com/projects/smithsonian/conserve-dorothys-ruby-slippers) to generate funding for research into the future conservation and preservation of the Ruby Slippers in preparation for the upcoming exhibition. The main purpose was to characterize the Ruby Slipper’s materials and their condition, as well as posit mechanisms of deterioration. The findings helped plan the Kickstarter research and informed decisions in selecting the most appropriate exhibition conditions for their continued display such as relative humidity, and temperature. Other issues currently being addressed through the Kickstarter research include whether an anoxic or low oxygen environment would be appropriate, and the effects of light levels and spectral quality for their continued display. 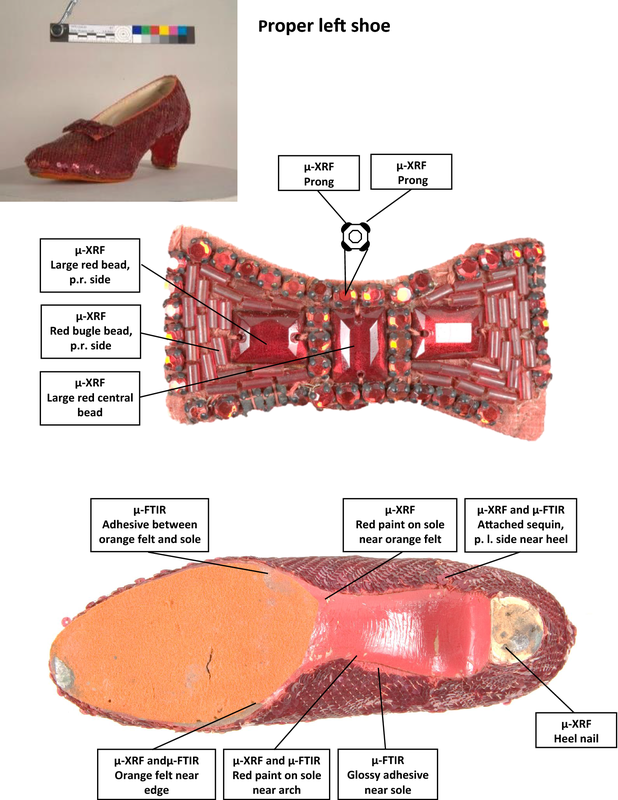 The materials characterization phase is also viewed as a valuable opportunity to learn about the original construction and subsequent history of the Ruby Slippers to inform and enrich NMAH’s curatorial research, public programs, and media initiatives. A commercial pump-style shoe with a decorative faille finish was purchased. The shoe was dyed red by the film’s costumer designers. A template of the shoe’s upper was cut out of a red fine-mesh netting, to which red sequins was sewn. The sequined netting was then sewn to the faille of the shoe including the upper and heel. The bows were handcrafted out of a stiff, loose weave red fabric support covered in the same red mesh, to which red beads and rhinestones (referred to here as “stones”) were attached. The beads (three large rectangular and many bugle) were sewn directly to the bow, while the stones were held by prong settings which are sewn to the bow. The finished bow is sewn at the top center of the vamp. The sole was painted red, presumably to complete the red appearance over the entire shoe. A layer of orange felt was glued to the shoe’s sole presumably to dampen the sound during dancing. The p.r. shoe has an additional layer of orange felt glued over the first. As observed by NMAH’s staff prior to our study, the Ruby Slippers are comprised of two shoes from different pairs, as evidenced by some visual differences (Fig. 1). The shoes differ in the shape of the quarter linings, interior manufacturing marks, and the height of the throat. The proper right (p.r.) shoe’s quarter lining is “V” shaped, while the proper left (p.l.) shoe’s quarter lining has an “hourglass” shape. The interior manufacturing mark of the p.l. shoe is stamped with the model number “5 C 11869 D536”, while the p.r. shoe insole is stamped with a different model number, “5 BC 152504” and “INNES SHOE CO., LOS ANGELES, PASADENA & HOLLYWOOD”. The throat of the p.l. shoe appears larger and rises higher on the foot than that of the p.r. shoe. Finally, the p.r. shoe is 3 mm longer than the p.l. shoe. Dorothy’s Ruby Slippers (NMAH, Accession No. 1979.1230; each shoe is 12.70 cm × 7.62 cm × 24.13 cm). Physical differences between the shoes indicate they are not a matched pair. Ruby Slippers from The Wizard of Oz used courtesy of Warner Bros. Entertainment Inc. TM and © Turner Entertainment Co.
Possible later repairs were made on the p.r. shoe, including the replacement of red stones with colorless ones that are painted red. We might expect this type of mechanical damage to be present since the Ruby Slippers were probably heavily used during the filming. Documentation of these later amendments to the shoes help conservators understand change over time, and hence, more about their use as costume props. The materials analysis survey was carried out using the non-invasive and minimally-invasive analytical methods as described below to optimize characterization of the broad range of materials present on the shoes within the scope and time frame of the study. Because the Slippers are not a matched pair, materials from each shoe were analyzed when possible. The µ-XRF instrument (Bruker Artax 800, Berlin, Germany), a micro-focus version of an x-ray fluorescence spectrometer with an open-architecture air-path, was used to study many components of the Slippers. It is composed of a Rhodium X-ray tube with a poly-capillary lens beam focus (beam diameter approx. 100 µm), and an XFlash silicon drift detector (SDD). Measurements were taken using an excitation voltage of 45 kV, a beam current of 200 µA, and a 30 s live time. 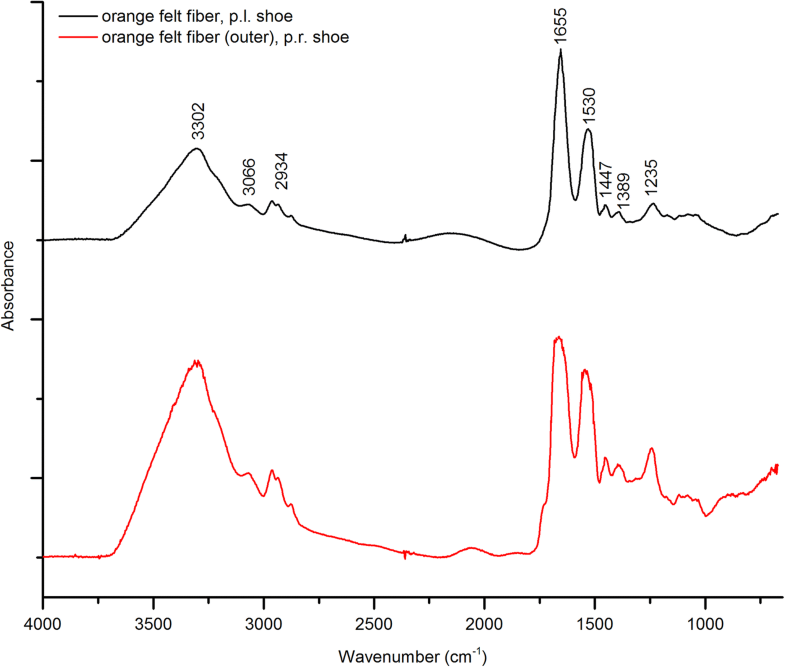 The µ-FTIR spectrometer (Thermo Nicolet 6700, Madison, WI, USA) was used to study organic materials on the shoes. It is equipped with an infrared light in the mid-infrared region (wavelengths from 2.5 to 20 µm, frequencies between 4000 and 650 cm−1), a Continuum microscope, and a MTC-A detector. Each spectrum was collected for 64 scans at a resolution of 4 cm−1. Samples were placed and flattened using a diamond cell before examination in transmission mode, and spectra were processed using the OMNIC software v.8.3. 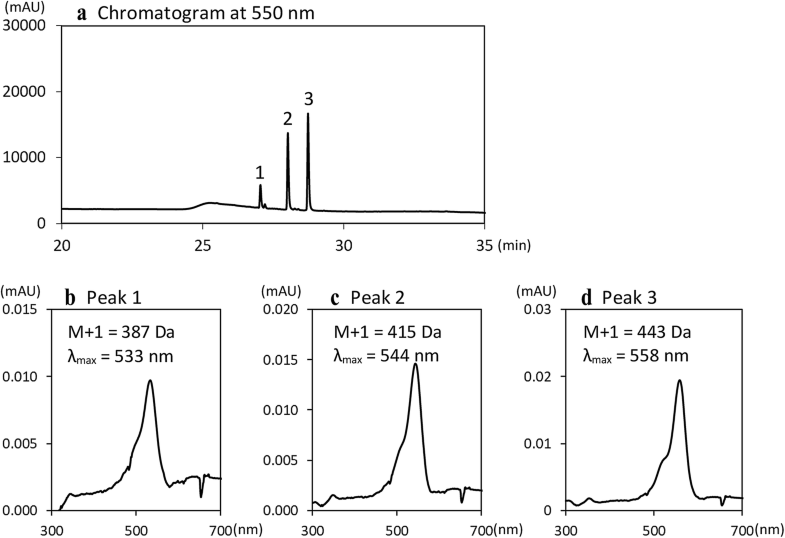 Micro-FTIR spectra were identified using the Infrared and Raman Users Group (IRUG) reference libraries, the HR Hummel Polymer and Additives library, and the ASTER mineral library. A polarized light microscope (Nikon Eclipse E600, Tokyo, Japan) coupled with a SPOT Pursuit Peltier cooled camera with 1.4 mega pixel resolution was used for fiber identification. Each fiber sample was extracted using fine tweezers under magnification and placed with distilled water on a glass microscope slide with coverslip. This process provided temporary slide mounts that allowed sample reuse should further analysis by other methods be desired. The PLM samples were studied by comparison to bleached spun silk, cotton, and wool fiber references from Testfabrics, Pittston, PA, USA (see: http://www.testfabric.com). Fiber identification was based on the observation of the fiber structure and diameter, with consultation of reference literature [2–6]. Dye analysis was performed using a HPLC–DAD–MS (Shimadzu LCMS-2020, Japan) with an automatic injector, gradient pump, and column oven. Separation of colorants was performed on a Phenomenox® Luna C18 reversed phase column (2 mm dia. × 150 mm long; 3-µm particle size), operated at a flow rate of 0.18 mL/min. Columns were eluted with acetonitrile–water gradients containing 0.1% formic acid. An extracted micro-sample of the red coating on detached sequin 1 was dissolved in 50 µL 100% MeOH and pipetted to a 1.5 mL plastic tube. After purification, the mixture was frozen using liquid nitrogen and evaporated under vacuum to decrease volume to 35 µL. The HPLC–DAD–MS data analysis was carried out using LabSolution software ver. 5.1.1, and detection was done in both negative and positive ion modes. 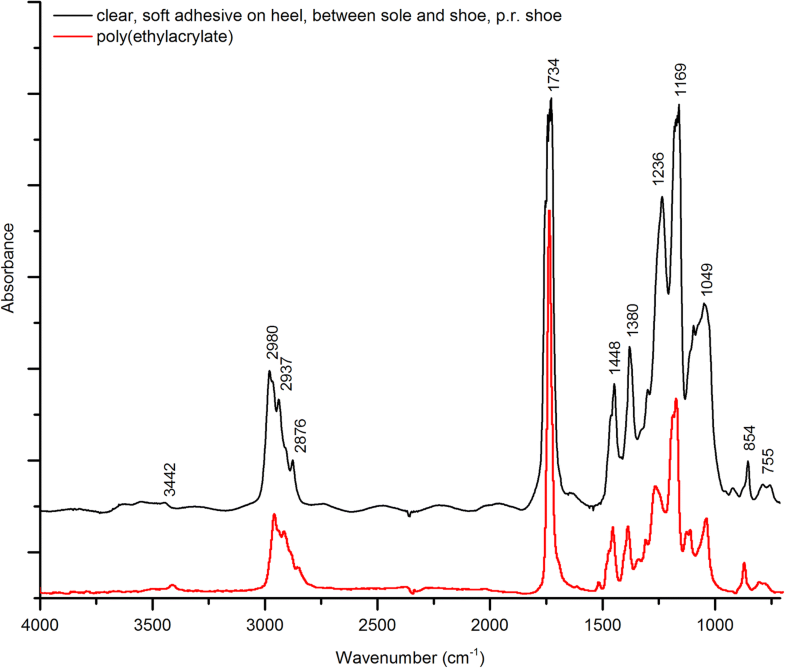 Non-invasive analysis locations for µ-XRF and sampling locations for µ-FTIR are shown for the shoes in Figs. 2 and 3. 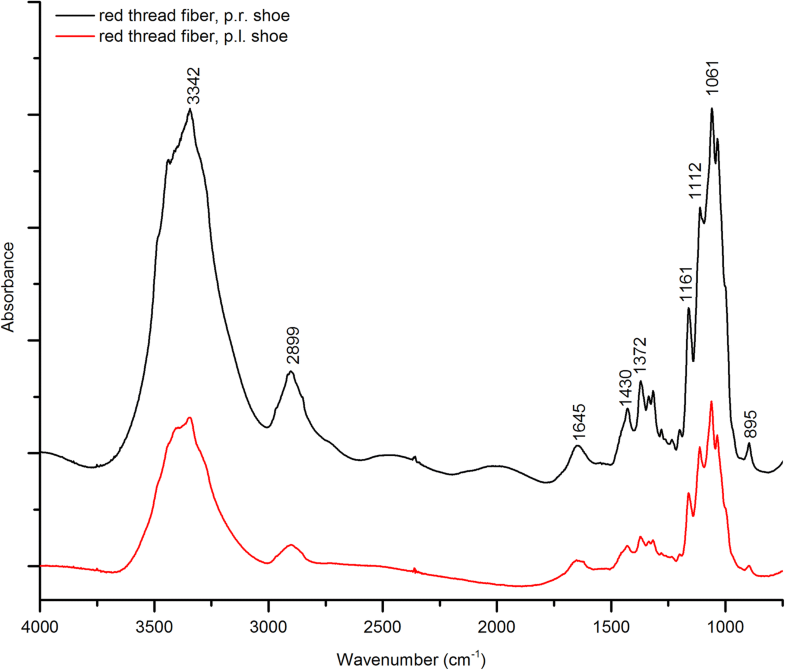 Another technique, HPLC–DAD–MS was used for red dye analysis on detached sequin 1.
µ-XRF and µ-FTIR sampling locations on the proper right (p.r.) shoe of the Ruby Slippers. (Some fiber sample locations not shown). Ruby Slippers from The Wizard of Oz used courtesy of Warner Bros. Entertainment Inc. TM and © Turner Entertainment Co.
µ-XRF and µ-FTIR sampling locations on the proper left (p.l.) shoe of the Ruby Slippers. (Some fiber sample locations not shown). Ruby Slippers from The Wizard of Oz used courtesy of Warner Bros. Entertainment Inc. TM and © Turner Entertainment Co.
Because µ-XRF is quick and non-invasive, this technique was used on most materials including sequins, prong settings, beads and rhinestones, red paint, felt, and heel materials. Elemental determinations were qualitative rather than quantitative: major, minor, and trace designations were estimated to approximate the relative intensity of the signal for each element. 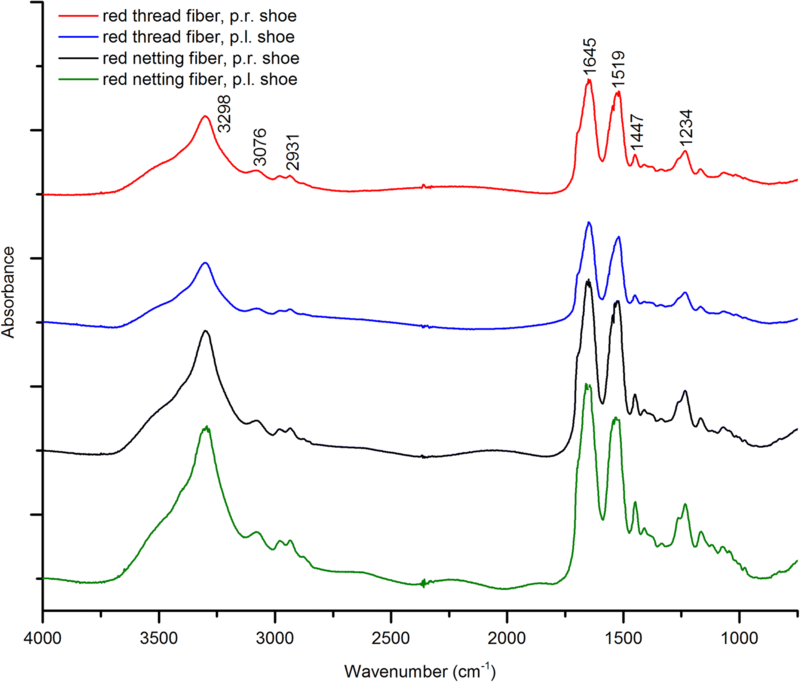 Micro-FTIR analysis focused on characterization of the two detached sequins, various fibers, red paint on the soles, adhesive residues, and a red coating found in small areas of the bows. PLM was used on textiles and threads to identify fiber content. The following discussion presents the research findings, and the full results of the materials characterization are summarized in Appendix (Table 3). This type of glass was found on the large ruby red bead in the center of the bow on both shoes. Major elements are zinc, silicon, and potassium, while minor elements are iron and selenium. Cadmium is present as a trace. The type 1 glass is consistent with recipes to produce selenium ruby glass , where substantial amount of zinc oxide along with selenium and cadmium sulfides are used to obtain an intense ruby color. This type of glass is similar to the type 1 with the addition of calcium, probably lime delivered. It was found on the bugle beads as well as the red stones on both shoes. Small differences in arsenic content shows potential for differentiating between the bugle beads with a slightly lower amount and the red stones with a slightly higher amount. Slightly higher arsenic amounts are consistent in the red stones. Similar to the type 1 glass, the elemental composition of the type 2 glass indicates additions of zinc oxide, selenium and cadmium sulfides which may have been used to obtain the ruby color. This type of glass was found on a few colorless replacement stones on the bow from the p.r. shoe. It contains lead, potassium and calcium as major elements, and silicon, iron, zinc, arsenic, copper, and barium as minor elements. These stones are colorless, and have no selenium and cadmium content as found in types 1 and 2 glasses. The replacement stones appear to have been covered with a red coating, identified as cellulose nitrate by µ-FTIR. The difference in stone color and composition compared to glass types 1 and 2, along with the red coating confirmed that these stones were replacements and painted red to match the original stones. Similar colorless stones were not found on the p.l. shoe. Micro-XRF analysis of the prong settings holding the stones showed that they are primarily composed of copper (Cu) and zinc (Zn) with various other minor and trace elements. This finding is consistent with the fact that as a non-precious alloy, brass was often used in costume jewelry during the early twentieth century. Based on visual inspection and compositional analysis of the beads, stones, and metal prong settings, the bows of each shoe were similarly constructed using the same glass and brass materials. Slight variations in each bow’s shape and size can be attributed to their handcrafted construction. Two detached sequins, both likely from the p.r. shoe, were examined by µ-FTIR, as well as a sequin still attached to the p.l. shoe. From the p.r. shoe, detached sequin 1 is in a relatively good condition, while detached sequin 2 has cracks and losses of its red coating. Results are consistent with the presence of a protein-based core (most likely gelatin) laminated on both sides with a thin layer of cellulose nitrate. The findings are in agreement with known compositions of gelatin-based sequins of similar age reported in the literature [7–10]. 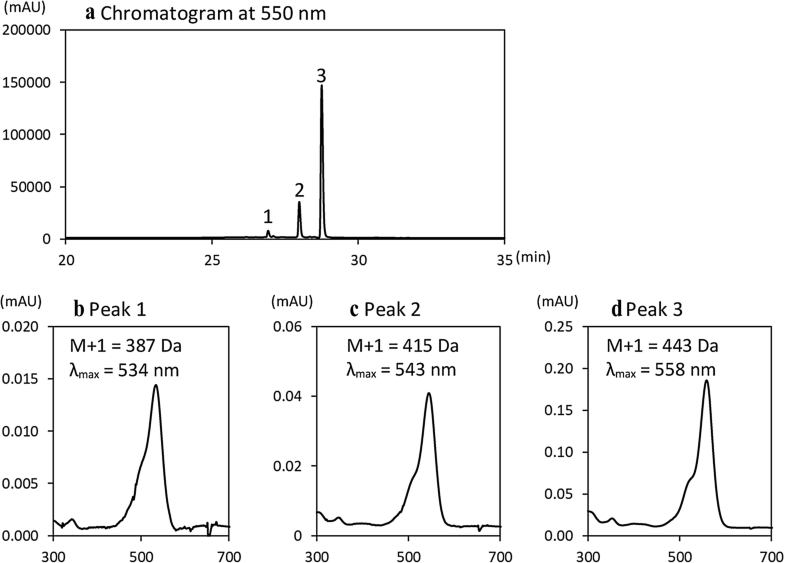 Figure 5 reports the µ-FTIR spectrum of detached sequin 2’s core and shows characteristic vibrational bands consistent with protein (amide I and amide II bands at 1644 and 1543 cm−1 respectively, amide III at 1240 cm−1, and amide A or N–H stretching around 3304 cm−1). The µ-FTIR spectrum of the red coating on detached sequin 2 shows characteristic features associated with the presence of cellulose nitrate (strong nitrate group absorptions at 1650 and 1280 cm−1, but also strong peaks at 1073 and 841 cm−1 (Fig. 6). A peak at around 1715 cm−1 may be associated with the carbonyl of a plasticizer. A sample of red cellulose nitrate coating taken from detached sequin 1 showed three colorant peaks in the HPLC–DAD–MS chromatogram detected at 550 nm (Fig. 7). The data suggest that the three compounds likely have related molecular structures based on their similar UV–Visible spectra and mass. Mass data indicates that these structures likely differ by one (or two) ethyl (–CH2CH3) or two (or four) methyl (–CH3) groups, which could be related to the colorant and its degradation products and/or impurities. 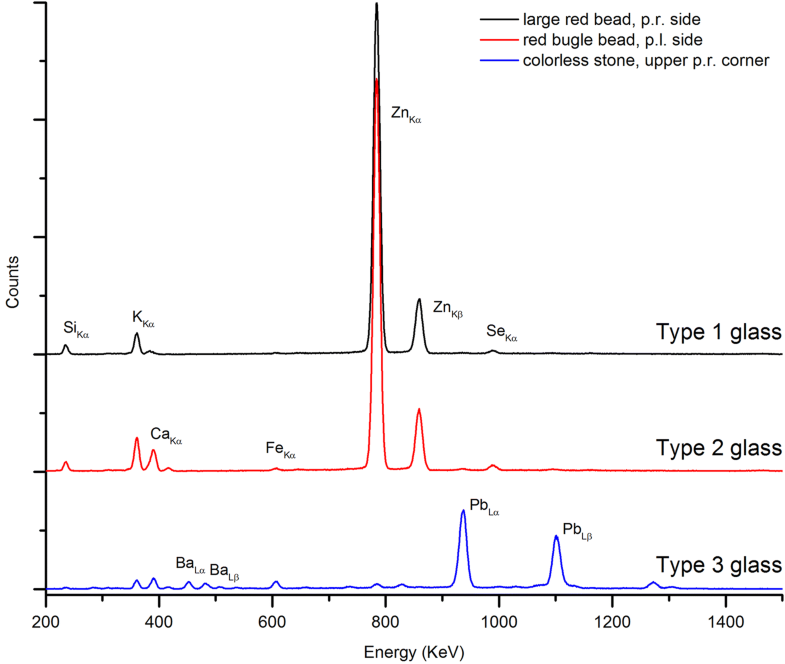 Based on mass and UV–Visible spectrum, Peak 3 can be attributed to the red dye Rhodamine B. Figure 8 shows similar data for Rhodamine B extracted from a historic reference dye sample (textile sample #74, sheet No. 13, see: ). The data for the textile sample #74 was found to be the same as for the red colorant extracted from detached sequin 1 from the Ruby Slippers. The HPLC–DAD–MS peaks of the sequin’s red colorant had similar retention times and UV–Visible spectra of three peaks detected compared to this reference sample. Molecular masses of the compounds in the sequin’s red coating matched those of the Rhodamine B reference. 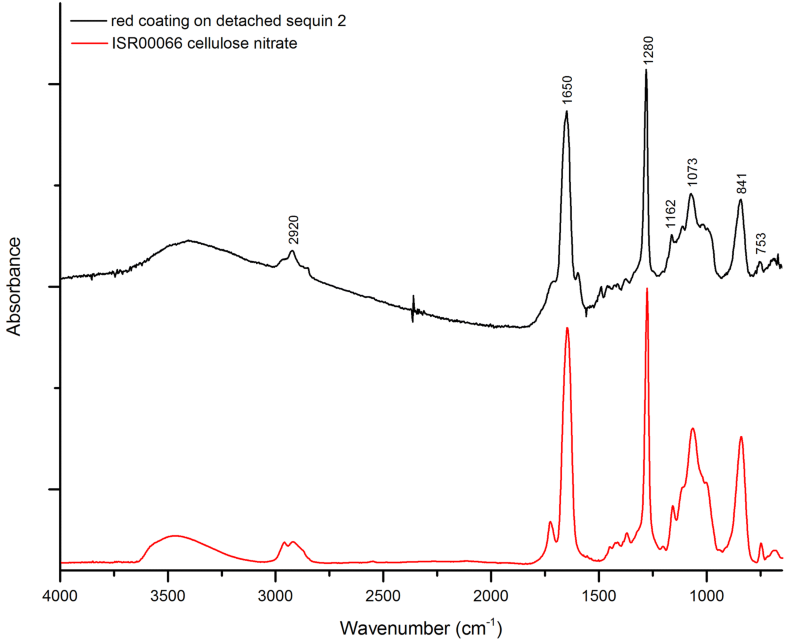 The red colorant from detached sequin 1 was also compared with a mid-twentieth century chemical-grade Rhodamine B reference manufactured by Allied Chemical and Dye Corporation, National Aniline Division. The Allied Chemical Rhodamine B reference showed the same HPLC elution time, absorption spectrum, and molecular mass as the sequin’s peak 3. However, peaks 1 and 2 were not observed in the Allied Chemical sample. This finding suggests that the Rhodamine B used for the red sequin coating may have been made by a different company, and/or at a time when pure starting materials were not used to produce the dye. Regardless, the analytical data indicate that the red colorant used for the sequins of the Ruby Slippers is Rhodamine B. 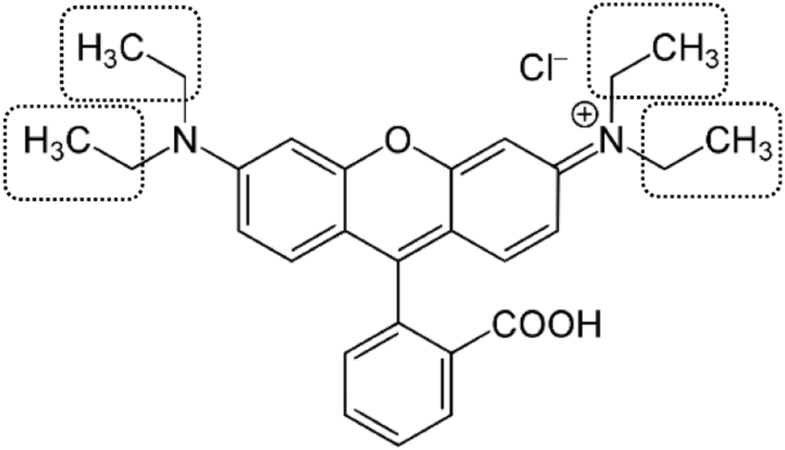 We further hypothesize that the presence of peaks 1 and 2 can be explained by examining the structure of Rhodamine B (Fig. 9). If a single ethyl (–CH2CH3) group is missing, the molecular mass would be 415 Da; if two are missing, the mass would be 387 Da. The molecular mass is consistent with those found for peaks 1 and 2. A possible explanation for the presence of peaks 1 and 2 is that they are by-products remaining from the manufacturing process of Rhodamine B dye, such as the starting material N,N-diethyl-m-aminophenol  or an impurity such as N-ethyl-m-aminophenol. Alternatively, peaks 1 and 2 may arise from photo-oxidation of pure Rhodamine B, as described recently by Sabatini et al. . The fact that peaks 1 and 2 are much smaller in Fig. 8 compared to Fig. 7 is consistent with the idea that the textile sample #74, having been kept in a book away from light and air, may have undergone less photo-oxidation than detached sequin 1. 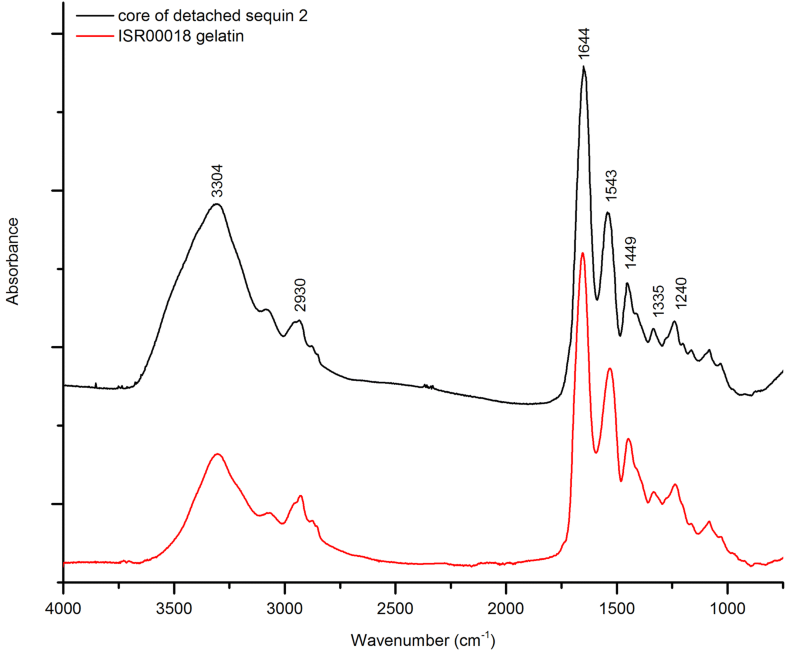 Detached sequin 1 was found to contain a minor amount of silver (Ag) by µ-XRF. Historically, some manufacturers used thin metallic coating (gold, silver, or aluminum) laminated with other structural layers of sequins , presumably to enhance reflective effects. The silver content was slightly higher on one side than the other suggesting a silver-rich layer between the protein-based core and the cellulose nitrate coating on only one side. Figure 10 shows the extremely thin and fragile silver layer. In exposed areas on some sequins where the cellulose nitrate has been lost, the silver appears to be covered with a black silver sulfide tarnish. Detached sequin 1 (5 cm × 0.2 mm). 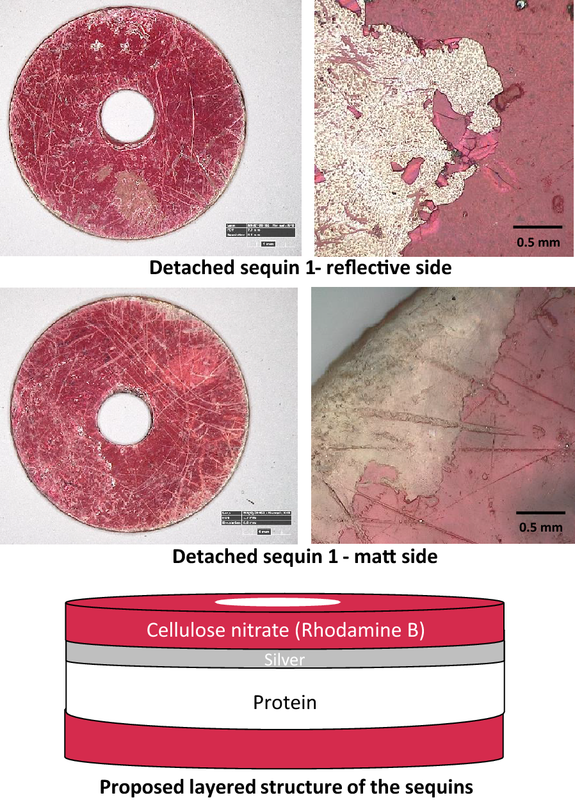 Top: Reflective side, and a detail showing the presence of a thin silver layer in areas where the cellulose nitrate/Rhodamine B layer has been lost due to degradation. Center: Matt side, and a detail showing no similar silver layer. Bottom: Schematic diagram of the proposed layered structure of the sequins, where the top side is slightly more reflective, and the bottom side is more matt. Ruby Slippers from The Wizard of Oz used courtesy of Warner Bros. Entertainment Inc. TM and © Turner Entertainment Co. 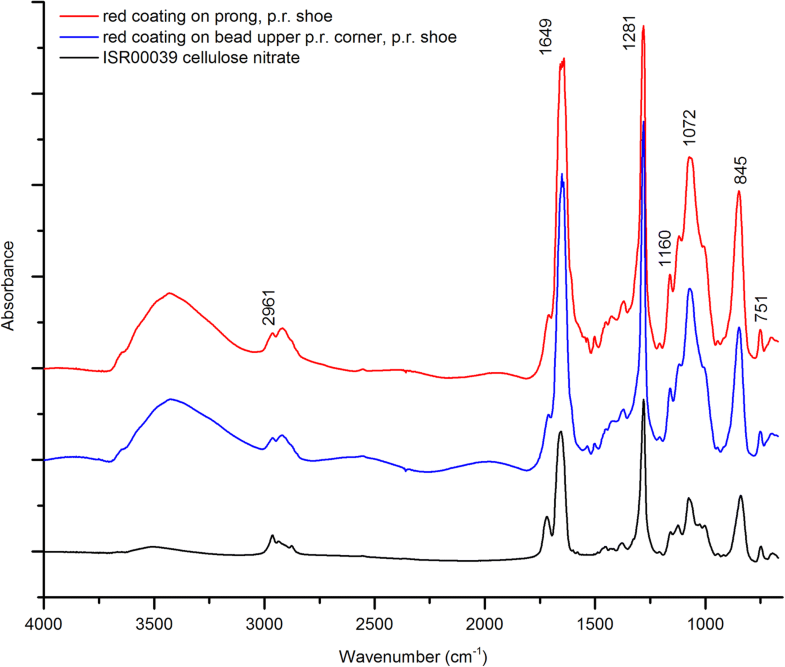 The µ-XRF analysis of red paint on the soles of both shoes shows the presence of cadmium, selenium, barium, and sulfur. These elements are consistent with the colorant cadmium red lithopone, a mixture of cadmium sulfo-selenide co-precipitated with barium sulfate  (Fig. 11). The red paint on the p.l. shoe also contains a minor amount of zinc, suggesting the presence of a small amount of zinc oxide from the inclusion of zinc white in the paint formulation. 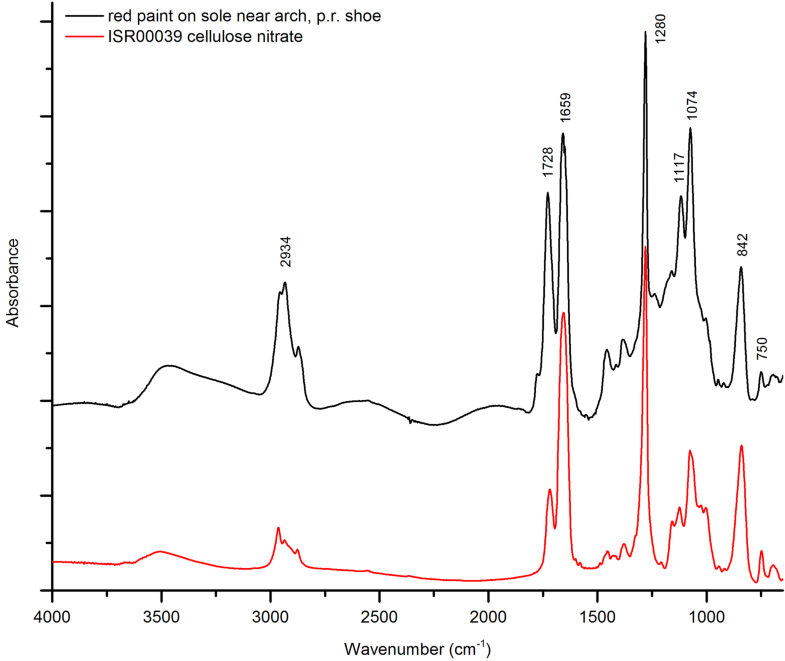 A µ-FTIR spectrum of the red paint from the sole of the p.r. shoe is shown in Fig. 12, indicates that the paint formulation is based on cellulose nitrate; the spectrum for the red paint from the p.l. shoe provided the same result. Historically, paints containing cellulose nitrate were mixed with other resins to provide higher gloss . The presence of an alkyd is also suggested due by a more intense carbonyl peak at 1728 cm−1 and characteristic C–H stretching at 2934 and 2870 cm−1. In addition, the increased intensities in the fingerprint region peaks at 1117 and 1074 cm−1 with shoulder peaks at 1181 and 983 cm−1 suggest the presence of barium sulfate. 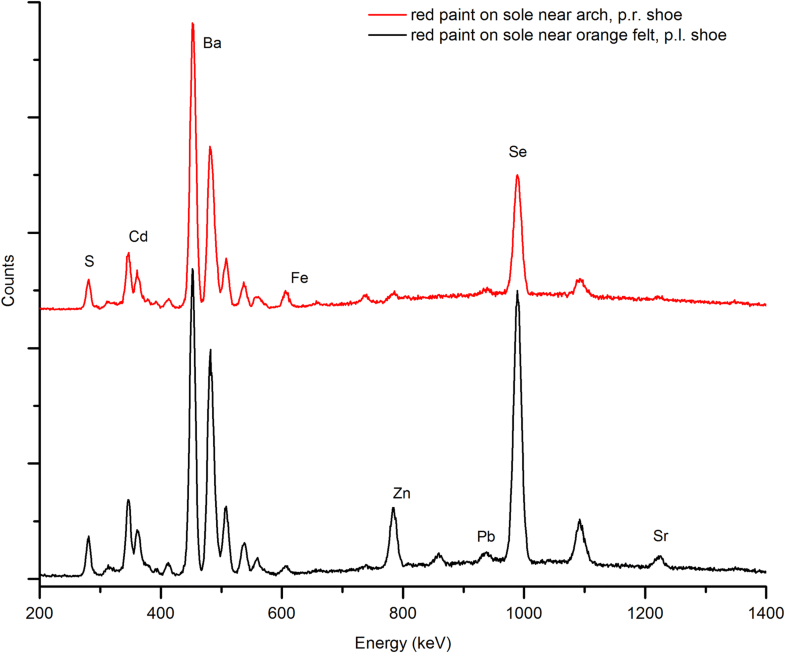 Micro-XRF analysis of the sole detected barium, selenium, cadmium, and sulfur as the major elements; consistent with cadmium red lithopone as the red pigment and barium sulfate as a filler. Several adhesives were sampled, including those on detached sequin 2 and on the soles and felt of both shoes. Polyvinyl acetate (PVAc), cellulose nitrate (with camphor plasticizer), poly(ethyl acrylate), and natural resin were identified. The results of the µ-FTIR analysis of these adhesives are summarized in Appendix (Table 3). As shown in Fig. 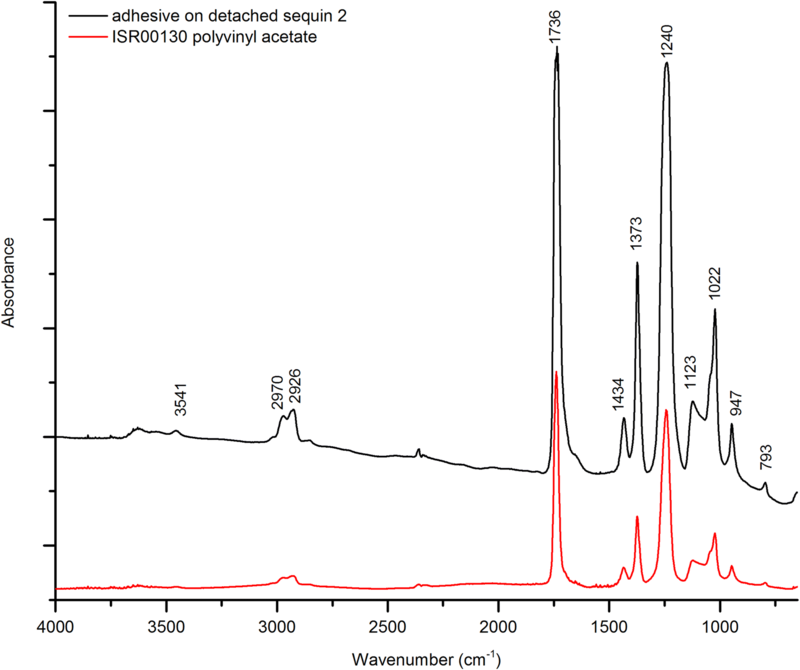 13, the µ-FTIR spectrum of the adhesive residue collected on detached sequin 2 has spectroscopic similarities with polyvinyl acetate (PVAc) (carbonyl C=O stretching at 1736 cm−1, C–H asymmetric deformation at 1434 and 1373 cm−1, and the C–O stretching at 1240 cm−1). This material is likely contamination by an adhesive residue on the surface of the sequin. PVAc was also found in the adhesives sampled—to attach the single piece of felt to the p.l. shoe and the second felt piece over the first one on the p.r. shoe. Originally two separate felt layers were thought to be present on the p.l. shoe, but further examination showed only a single piece of felt. A clear, soft adhesive was seen on the heel of the p.r. shoe between the sole and upper. This material is thought to be a repair as no similar adhesive was seen elsewhere, and because its application runs slightly over on to the surface of the commercial-style pump. The µ-FTIR spectrum of the adhesive of the sample shows characteristic features that may be associated with poly(ethyl acrylate) (C–H stretching at 2980, 2937, and 2876 cm−1, C=O stretching at 1734 cm−1, C–H bending at 1448 and 1380 cm−1, C–O stretching at 1236 cm−1, C–C stretching at 1169 and 1096 cm−1, and C–H rocking at 854, 787 and 755 cm−1); see Fig. 15 in Appendix. 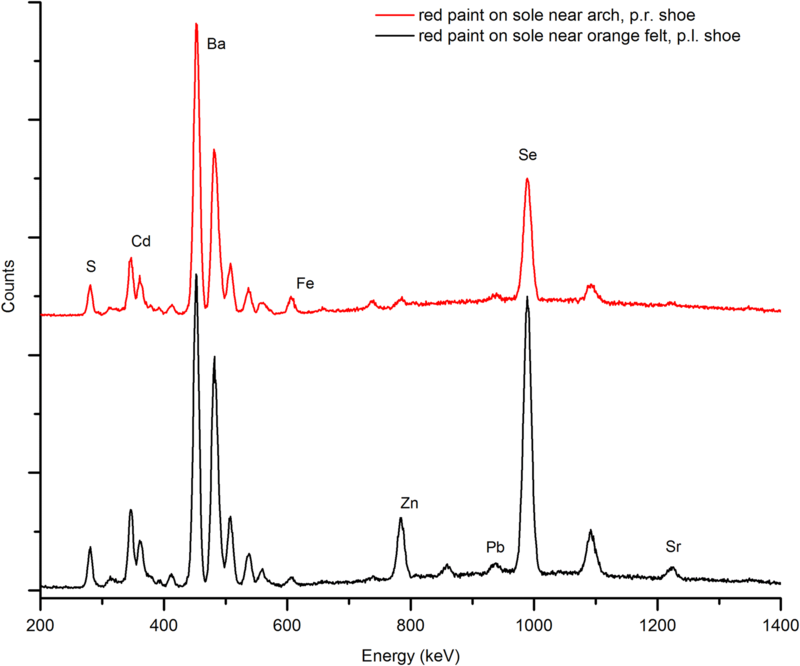 Micro-FTIR analysis was performed on two similar pale red coating samples taken from a colorless stone and its prong setting at the upper p.r. corner of the bow on the p.r. shoe. Cellulose nitrate was identified as the coating (Fig. 16 in Appendix), but the red colorant was not identified. The presence of this red coating confirms that this colorless stone was added as a repair and subsequently painted red to match original stones. Sampling of thread and textile fibers was limited by the availability of loose fibers in order to avoid damage to the shoes. PLM samples were extracted from 11 loose fibers. A summary of the results are given in Table 1, and more detailed descriptions and micrographs are given in Appendix (Table 4). Some of the fiber samples were also studied by µ-FTIR, as summarized in Appendix (Table 3); this method was found to be complementary in confirmation of the presence of protein such as found in wool and silk, and cellulose present in plant material. Note that synthetic materials were not found, as they did not become widely available until several years after the creation of the Ruby Slippers. PLM study of p.r. shoe red netting and the thread used for its attachment showed smooth fibers regular in diameter (average 15 µm). The morphology indicated identification as silk, consistent with µ-FTIR data showing bands consistent with protein (Fig. 18 in Appendix). Similar morphology was found on the p.l. shoe for the red thread holding the netting to the shoe and the faille fabric (weft), with average fiber diameters of 13 and 12 µm respectively. The average fiber diameter for all four samples is close to those reported for silk of 10–13 µm . Four fiber samples were identified as cotton, including thread holding sequins to the netting on the p.r. shoe, sequin thread from the p.l. shoe, the structural shoe fabric, and the woven bow support fabric. Average fiber diameter ranges from 17 to 23 µm, which is within the range for cotton, 1–40 µm . The cotton fibers of the bow’s support thread are more rounded in cross-section than is typical for natural cotton, which suggests that the cotton was mercerized . The sequin thread from the p.r. 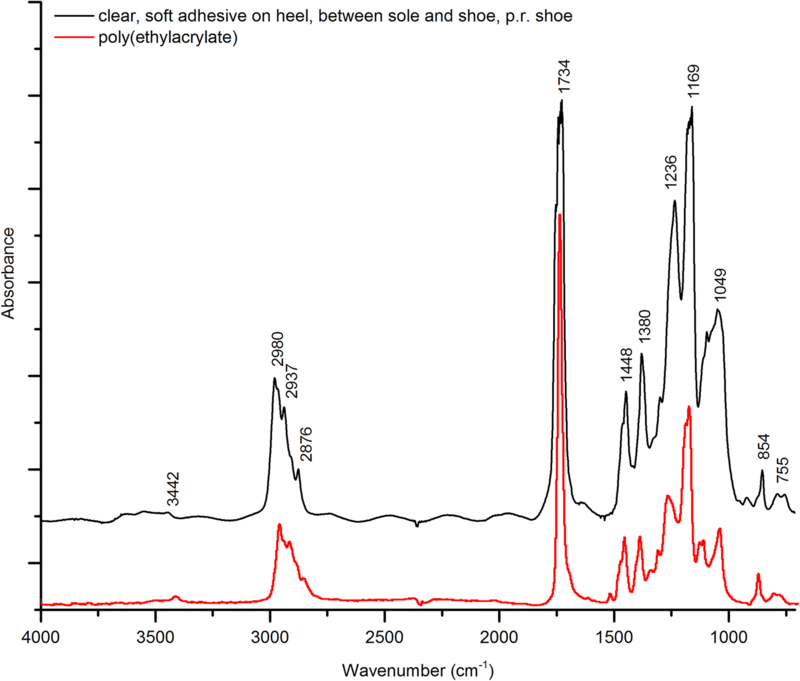 shoe was also analyzed by µ-FTIR and found to be composed of cellulose (Fig. 19 in Appendix), supporting the identification of the thread as cotton by PLM. As previously mentioned, the p.r. shoe has two layers of orange felt glued to its sole, while the p.l. shoe has a single layer. No significant visual differences in the felts were apparent otherwise. PLM samples of the orange outer felt from both shoes were observed to be composed of a mixture of fiber that contains orange-dyed wool as it major component. Minor amounts of other fibers, mostly colorless, were also observed by PLM. The felt from the p.l. shoe also contained some undyed wool, which was not seen in the felt from the p.r. shoe. This finding suggests the felts for the two shoes may be different, but the small size of the felt samples prevented conclusive determination. The wool fibers have the surface structure of overlapping scales typical of wool. Average fiber widths are 24 µm for the p.r. shoe and 30 µm for the p.l. shoe, well within the reported range for wool, which varies from 10 to 70 µm depending on the fiber type and species . The µ-FTIR spectra of the wool fibers from the orange felt from the p. l. shoe and the outer orange felt from the p.r. shoe (Fig. 17 in Appendix) show characteristic spectral features that may be associated with protein. This finding supports the wool identification by PLM. Analysis on the soles and heels was minimal. A PLM sample from the sole near the arch was taken from the p.r. shoe. The fibers were found to be light brown with the average width of 7 µm, which are characteristics consistent with leather. 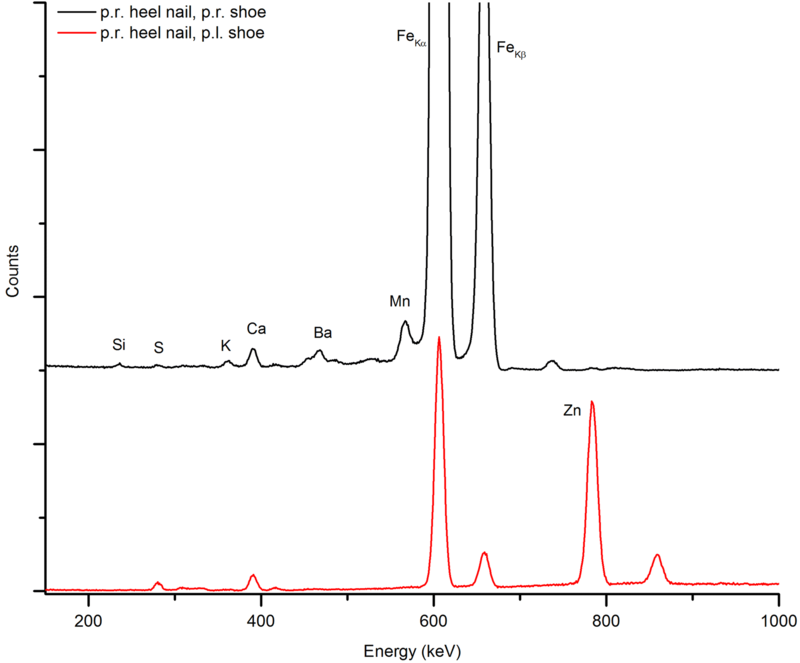 One heel nail on each shoe was analyzed by µ-XRF. The nail of the p.r. shoe (Fig. 14) had a high iron content, suggesting an iron or steel composition. The nail of the p.l. heel had a relatively higher zinc content and lower iron content, suggesting a galvanized iron or steel composition. This finding is consistent with the silver color of the nail as observed under magnification. 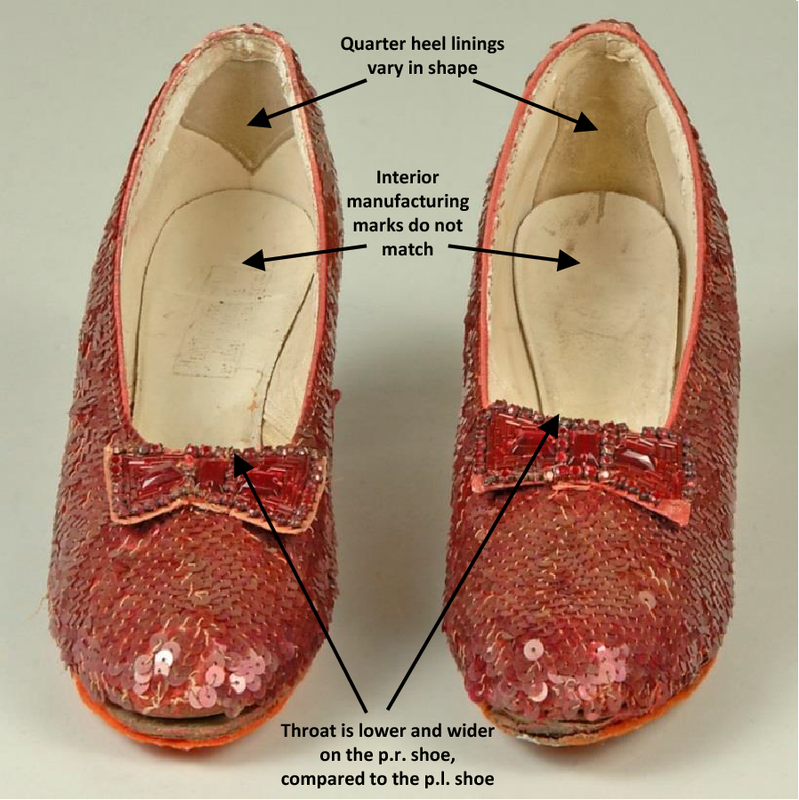 The major findings from the materials survey of NMAH’s Ruby Slippers including both the p.r and p.l. shoes are summarized in Appendix, Table 3. The various materials found on the Slippers are consistent with the time of their creation. Prior to the present study, NMAH staff had observed that the Ruby Slippers were from different pairs and that they were created in the same manner by adorning a commercially available pump-style shoe. 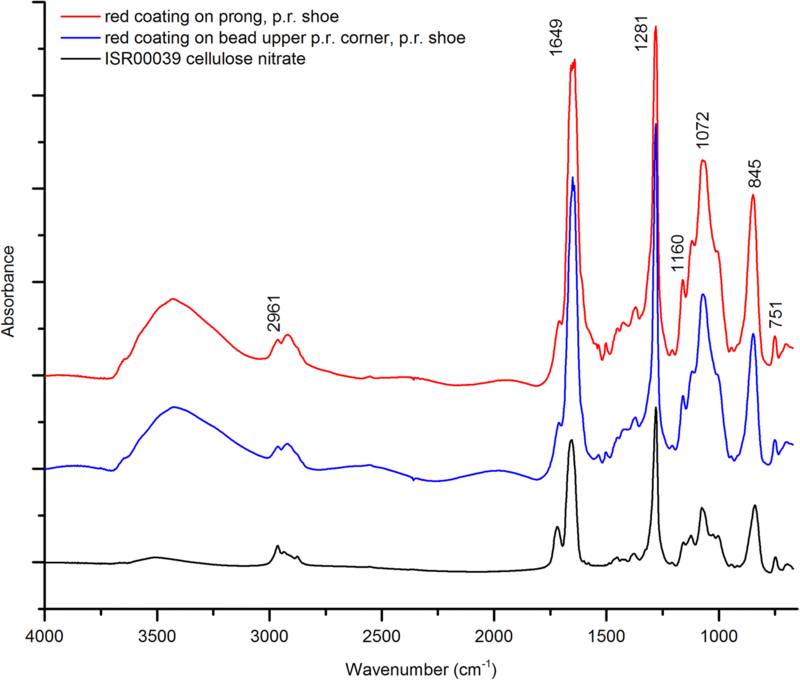 Analysis of the red sequins confirmed that the sequins on both shoes are similar in composition and structure (a gelatin core with a cellulose nitrate coating), as well as in their method of attachment. Decorations on the bows of each shoe are also largely identical in selenium ruby glass bead and stone, and brass prong compositions. Some variation in the bows’ sizes and shapes can be attributed to handcrafted construction. The orange felt on the bottom of each shoe appears to vary slightly in fiber content, as do adhesives on the shoes. Areas on the bow of the p.r. shoe are identified as repairs made using colorless glass stone replacements of a lead–potash–lime–silica glass (labeled Type 3). The replacements were painted to match the originals using a red cellulose nitrate-based material, which may have been applied as nail polish or hobby paint. The heel of the p.r. heel appears to have been re-glued with a poly(ethyl acrylate) adhesive. All of the findings suggest the Ruby Slippers were actively used during filming, and likely repaired and modified at that time. The black tarnish on the sequins presents a treatment challenge because it has dulled the appearance of the Slippers. Minimization of the tarnish is likely to be difficult if not impossible given the fragility of the outer red cellulose nitrate layer. A less invasive possibility would be to manipulate the sequins so that the maximum number of untarnished ones have their reflective side facing outward. In any case, further degradation of the silver layer could be reduced by placement of sulfur scavengers in the display case. The standard gallery environment within the museum are 70 °F ± 4 and 45% ± 8 RH, parameters which are safe for most objects and comfortable for visitors. The Ruby Slippers were previously displayed at 30 lux/3 foot-candles. Based on the relevant conservation and conservation science literature [17–29], Table 2 summarizes exhibition recommendations for temperature, relative humidity and light exposure ranges for some of the various materials identified on the Ruby Slippers. Both gelatin and cellulose nitrate benefit from cold storage while off display, however the paint, textiles and leather can become desiccated and brittle at low temperatures. Although not ideal for the cellulose nitrate coating on the sequins, we conclude that the most acceptable conditions for the exhibition of the majority of the materials is 65 °F, 45–50% RH and 30 lux/3 foot-candles. These parameters incorporate the coolest temperature for the majority of materials, standard RH values, and the conservative light values which have been successfully used at NMAH in the past. Low light values ensure the minimization of ultraviolet-induced degradation, a major cause of cellulose nitrate deterioration. Questions remain as to what environmental ranges can be achieved and maintained in the constructed display case, whether an anoxic environment for the exhibition case would be beneficial, as well as other logistical and curatorial considerations including costs. Regardless, the current work lays a foundation on which to make an informed decision on the basic environmental conditions for the permanent exhibition of the Ruby Slippers at NMAH. Materials of the Ruby Slippers were characterized within the limited time frame to accommodate ongoing exhibition, and the findings are being used to prepare plans for long-term preservation and exhibition. A future phase of research is being considered as NMAH curators and conservators evaluate the current results and develop goals for an expanded analysis program. The current work has also revealed significant evidence of the original construction and subsequent history of the Ruby Slippers which promises to enrich our understanding of this iconic object. Basic definitions of shoe parts are as follows: heel—the part of the sole that raises the rear of the shoe in relation to the front; insole—the inner flat bed of the shoe on which the foot rests; quarter lining—a covering applied to the inner rear and sides of the shoe; sole—the entire part of the shoe below the wearer’s foot; throat—upper middle portion of the shoe, upper—the part of a shoe that cover the toes, the top and sides of the foot, and the back of the heel; vamp—the section of upper that covers the forefoot. DW and RB initiated the investigation and provided conservation and historical expertise. JGD, GK, and CM undertook the analytical study and data interpretation. All authors read and approved the final manuscript. The authors thank Eric Jentsch, Deputy Chair and Curator, Division of Culture and Arts, Ryan Lintelman, Curator of the Entertainment Collection, NMAH for the opportunity to participate in this research. Mary Ballard, Senior Textile Conservator at MCI provided information and consulted on fiber identification. We also thank Robert Koestler, MCI Director, Paula DePriest, Deputy Director, Rebecca Kaczkowski, Preventive Conservator, Carol Grissom, Senior Objects Conservator, and Thomas Lam, Physical Scientist, all at MCI for their support and consultation. Blythe McCarthy, Senior Scientist at the Smithsonian’s Freer Gallery of Art and Arthur M. Sackler Gallery provided consultation on dye analysis. We also thank the Smithsonian’s Museum Conservation Institute for generous support for the project. See Tables 3, 4 and Figs. 15, 16, 17, 18, 19. Trace: Cl, Mn, Ca, Ti, Ag, Pb? The red colorant could not be characterized. Trace: Rb, Ba?, Cd?, Pb? Trace: Ba, Cu, Rb, Pb? Trace: Ca As/Pb, Rb, Ti? Trace: Cd, Mn, Rb, Pb? Silk, red dyed (identified by PLM). Dye could not be characterized. Chaudry MA, Khan MS, Khan MA, Qazi, MRI, Din D. Influential role of Al2O3 and B2O3 on selenium ruby glass. J Chem Soc Pak. 2008;30(4):541–5. http://jcsp.org.pk/ArticleUpload/617-2586-1-RV.pdf. Accessed 6 Aug 2018. Mecklenburg MF. Determining the acceptable ranges of relative humidity and temperature in museums and galleries: part 1, structural response to relative humidity. Suitland: Smithsonian Museum Conservation Institute; 2007. http://www.si.edu/mci/downloads/reports/Mecklenburg-Part1-RH.pdf. Accessed 6 Aug 2018. Mecklenburg MF. Determining the acceptable ranges of relative humidity and temperature in museums and galleries: part 2, Structural response to temperature. Suitland: Smithsonian Museum Conservation Institute; 2007. http://www.si.edu/mci/downloads/reports/Mecklenburg-Part2-Temp.pdf. Accessed 6 Aug 2018. Messier P. Preserving your collection of film-based negatives. Denver: Rocky Mountain Regional Conservation Center; 1993. http://cool.conservation-us.org/byauth/messier/negrmcc.html. Accessed 6 Aug 2018. National Park Service. Caring for photographs: general guidelines. Conserve O Gram 14/4, Washington, DC: National Park Service; June 1997. https://www.nps.gov/museum/publications/conserveogram/14-04.pdf. Accessed 6 Aug 2018. National Park Service. Caring for cellulose nitrate film. Conserve O Gram 14/8, Washington, DC: National Park Service; August 2004. https://www.nps.gov/museum/publications/conserveogram/14-08.pdf. Accessed 6 Aug 2018.